ESD Floor Finish / ESD Wax for Static Control! Diamond Hard, Brilliant Shine, Permanent Scuff Resistance! Reduces Static Generation on ALL Hard Surface Floors. Perfect for use on ALL ESD Flooring! Meets ANSI ESD S20.20-2014 97.2 when used on ESD Conductive Tiles! 1 gallon $48.99 $43.88 Buy Online! 1 case (4 each 1 gallon pails) $175.46 (3+ $163.76) Buy Online! 5 gallon pail only $218.08 (3+ $203.54) Buy Online! ElectraGlaze and our refined system of static control floor care products equal the Ultimate in anti-static performance and longevity. If you're like most of our clients you've grown weary of seeing your anti-static performance degrade to the point you're hoping for a Rainey day to diminish the static! No More Wishful Thinking or Praying for Rain! Low odor, low voc content, biodegradable and environmentally friendly. PERFECT for esd floors. ElectraGlaze is a unique, wear resistant, static control wax (floor finish) for use in ESD sensitive environments. Unlike typical static control wax, our advanced formulation features a proprietary, aqueous co-polymer blend of 22 active ingredients. This exclusive blend provides dramatically superior chemical, water and slip resistance. ElectraGlaze provides outstanding protection against scuff marks and abrasion in concert with outstanding anti static properties. Always use clean containers and non linting finish mops or wax applicators to apply ElectraGlaze. For string style mops soak the mop to remove any impurities and rinse thoroughly. Wring out the mop as dry as possible and dip the mop into the E-Glaze. Wring out the mop so that it does not drip and apply a thin even coat of E-Glaze to the entire floor. Don't allow the mop to become dried out as streaks in the floor will result. Allow the floor to dry thoroughly. The drying time will vary depending on temperature and humidity generally taking between 2 to 4 hours. After the first thin coat has dried for at least 2 hours reapply a second coat. For ESD flooring 2 coats are ideal. For non esd flooring (to eliminate nuisance static - not to gain compliance to the new standards) 3 to 5 coats are recommended. High speed polish for ultimate shine using ElectraShine Spray Buff. 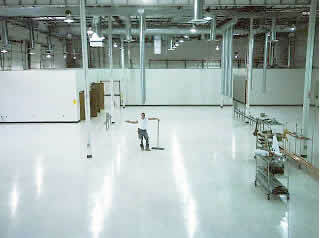 Note: ESD floor finishes (from United or any other Manufacturer) will not reliably render standard flooring conductive enough to meet the latest ANSI 97.2 standards for use as a primary ground for the Technician To reliably provide this level of conductivity coat the standard flooring as is shown here. Why use an ESD floor finish? Call for Large Volume Discounts and SAVINGS!